When a basketball player is out injured, the most important thing is getting them back to full fitness and hopefully getting them on the court before too long. There are some times when there is another element to the story though and it seems as though Rajon Rondo and the Boston Celtics are going to be the top news story once again this summer. There has already been a great deal of speculation about the future of the player and what moves the club will do to keep him on board. The thing is though; it looks as though there is another major talking point about the player. 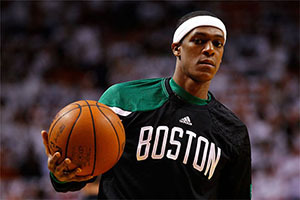 The Boston Globe newspaper broke the story that Rondo suffered a broken hand and that he would be out of action for around six weeks. This is an unfortunate injury, especially at this time of the pre-season. The newspaper reported that the player had suffered the injury through slipping in the shower. It is not as though this is the most common of sporting injuries but it is something that can happen. However, it seems as though there are now rumours building about the injury and whether it was caused by an innocuous slip in the shower. Was Rondo at a trampoline park when he broke his hand? An online sports site claims to have received an email which suggests that Rondo was actually at a trampoline park on the day where he claims to have suffered his injury. This means that there has been a lot of talk and gossip over whether the player suffered the injury at the park as opposed to slipping in the shower. This rumour makes a bit more sense but you can imagine that the Celtics wouldn’t be too happy to hear about their player placing themselves into a position where they could suffer such an injury. Was Rondo fighting when he broke his hand? However, as is so often the case with these stories, there is often another rumour coming just around the corner. DIME Magazine has given rise to suspicions that Rondo may have suffered the injury in an altercation. The place where Rondo’s hand has suffered a fracture is commonly referred to as a “Boxers fracture”. This is down to the fact that the type of injury is commonly associated with someone throwing a punch or being involved in a fight. Again, the Celtics will not be too happy to hear about this sort of injury coming to the fore from their player. While the Celtics have not yet disclosed which fingers or metacarpal have been injured, there is a feeling that if it was the fourth or fifth, then he may well have been involved in a fight and this style of injury is associated with hitting someone with a closed fist. The injury could see the player missing the firm month of the season, which will be a blow to the Celtics. Rondo is the highest paid player at the club, earning close to $13m in a season but he was absent for much of last season, only playing in 30 games. The team were hoping to ensure that Rondo played in well over double that amount this season but this will place some pressure on that expectation. You have to go back to the 2011/12 season to find the last time Rondo played in more than 55 games, which means that the Celtics are likely to be feeling quite exasperated with the player at this moment in time. If it turns out that Rondo was responsible for the injury, as opposed to it happening as part of an accident, you will think that the Celtics will not be best pleased with a player they may already be losing patience with.